Welcome back to another season of CommanderCast. Last season I covered laughably bad magic art as well as awesome alters in my Massive Art Attack series. This season I’ll be focusing more on the commander format itself. I still want to highlight great altered cards from time to time, but it won’t be the focus of this season’s writing. In Staple Remover I’ll be covering how to make your commander decks more entertaining and budget friendly. I’ve started powering down my decks, and you can too! It’s a blast. Get those EDH “staples” out of your deck because I’m about to get real weird with it. This week, for my first article of the season I’ll introduce you to the concept of the $0.00 deck. 1. Someone apologizing for winning quickly or ruining the board state. 2. You yourself feeling guilty for dropping the guillotine on a game in an unfair manner. 3. A prospective player turned off to the format because it looked too expensive. 4. Drawing a card in your deck you never want to play because it would either be a huge hate magnet or just unfun for too many people. It sounds like you might need to rethink your approach to the format and that’s what I’m here for with Staple Remover. I was that guy drawing or tutoring for cards he didn’t actually want to win with. Games were becoming stale, the EDH arms race was in full stride at my shop to the point where people weren’t playing their “fun” decks because they didn’t have a shot at winning with them. All of your decks in this format should be fun, so I finally took a step back and decided what I needed to do in order to enjoy the format again. I quit that play group and rethought my approach to deck building. It’s the best commander related choice I’ve made in the past year. The pitfall that a lot of commander deck builders run into eventually is the wide open, relatively unrestricted card pool you have access to. The banned list isn’t for competitive balance, so there are some seriously unfair broken options that are readily available. It is sort of like typing a cheat code into a videogame and going super god mode all over that level you were stuck on. Its a rush at first to have the power to steam roll everything in your path, but after a short time the challenge is dead and it just isn’t as much fun. Just because you can, doesn’t mean you should. That is where I come in this week. Deck building and playing can be more fun with some self-imposed restrictions. 1. You cannot spend any money on cards for the deck. 2. You can’t proxy any cards for the deck. 3. All cards must be obtained from your own collection and/or through trades. This works out a little differently than a more traditional budget deck. The overall value might eventually exceed $50.00, $75.00, etc. 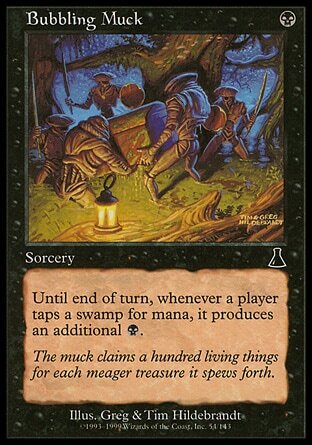 but with card prices fluctuating as much as they do, that value can tend to be a bit arbitrary anyways. The decks final value isn’t the main focus here, its more about creating an entertaining deck building challenge. Hopefully it means that you are going to sift through your own collection to find hidden gems you would normally not even consider. Maybe instead of that Sensei’s Divining Top you’ll run a Liar’s Pendulum. Just maybe, you’ll have a blast. This is not just some random theory I’m throwing out into the internet while I pile drive people with my infinite turn combo and laugh as you try to make a $0.00 deck. I went ahead and made one myself. 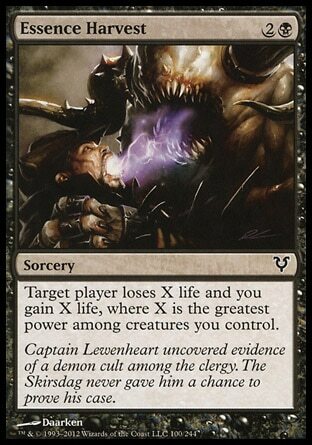 Last season I wrote an article about Brom, the former Magic card artist, where I came across the art for Hatred, one of my all time favorite cards. This got the gears turning in my head, how could I make a deck to take advantage of this cool card? Eventually it led to the Korlash list you see below. I came up with the self imposed limit that the entire deck had to be either from trades or from my card collection. I spent no money on this deck. It’s also not terrible. Its not a dominating, overpowering deck, but it can certainly win games. Void Maw – First of all it has trample, which works great in this list if you are putting a lash or scythe on him. Trample is also a pretty rare ability to find in black. Getting to the meat of it, it’s going to hose a lot of reanimation strategies by exiling creatures hitting the yard. Reanimation strategies except for yours that is. You can bring back any creature that got exiled to a graveyard at instant speed. And thats not all folks, it pumps itself in the process. But what does it cost to activate? Free! Feel free to grab back that select creature you want to target with Beacon of Unrest and pump the maw in the process. Essence Harvest – Its not unlikely to get Korlash up to a 14/14 or more without much effort, seven swamps and a Nightmare Lash does the trick. A potentially huge life swing is a pretty good deal at 3 mana. If you are running a deck that gets high power creatures onto the battlefield with regularity consider this one. Its like fling, only you don’t have to sac the creature, and you gain life for only one mana more. The biggest downfall is obviously the sorcery speed, but its certainly worth considering in some decks. You probably have a stack of these sitting around from when you opened Avacyn Restored, so you have nothing to lose by testing it. Dauthi Embrace – Unblockablitliy is pretty good. Screwing with other player’s combat is pretty good. 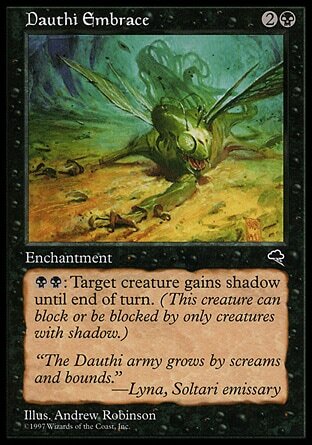 This card is great, its relatively cheap to cast and activate and you can play some pretty good political games by dispensing shadow onto other player’s creatures during combat. Me: Its like High Tide, only for black. 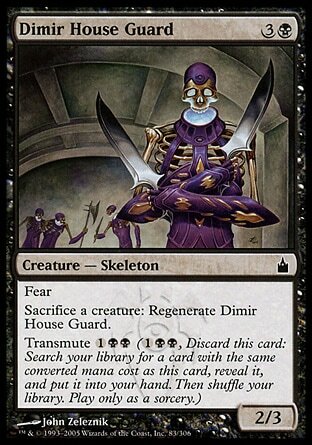 Dimir House Guard – Its a three mana tutor for all the critical 4 drops in this deck like Liliana of the Dark Realms, Lashwrithe, Mutilate, etc.. In a pinch it’s also a ⅔ creature with fear. Financially its also cheap as dirt compared to a lot of other black tutors out there. If you still want tutors in your deck without using the name brand staples like Demonic and Vampiric, the House Guard can be a solid bet. 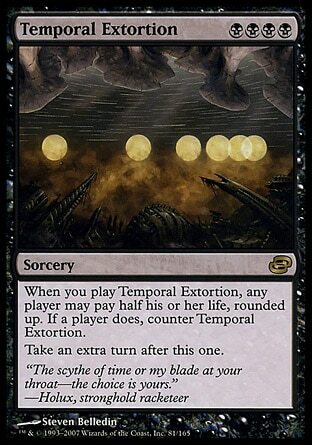 Temporal Extortion – I know what you are thinking, “When my opponent is given the choice, the card is bad because they will always make the best choice for themselves.” However, have you ever had a hard time choosing who to attack? Why resort to a cowardly dice roll when you can swing at the guy who just paid life to counter your black Time Warp. A great political card. Now the $0.00 deck restriction won’t be fun for everyone. I’m sure there are players out there with a much more sizeable collection than myself, who can pretty much brew up anything they wanted just by going through their own binders and boxes. In this case the $0.00 build won’t seem like much of a hurdle at all. For those of you who don’t like the idea of the $0.00 list, fear not, I will be back next week with an all new restrictions. Hopefully by the end of this season’s articles you will be able to mix and match deck building ideas however you see fit.